Tim Hayes is a clinical psychologist in Syracuse. He got his undergraduate degree in 1982, and earned a Ph.D. at the State University of New York-Binghamton. He has not lived in Westport for decades (though his mother is still here). But he often think of his hometown. As the Staples High School Class of 1977 graduate and his wife begin to plan for retirement, he realizes that where he is today is a direct result of where he grew up. He believes he’d be a very different person even if he was raised in Fairfield or Norwalk. Tim was born and raised in Greens Farms. “His” Westport was beautiful and idyllic. Within a 3-mile radius were the “wonderlands” of Burying Hill Beach (his “personal playground”), Long Lots Junior High, Staples, downtown Westport, and much more. 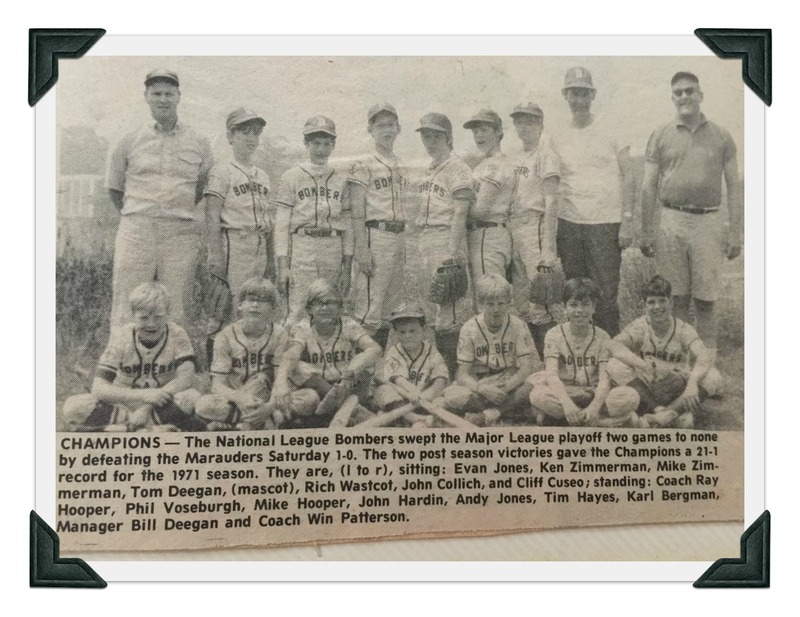 Tim Hayes’ Bombers went 19-1, and won the Westport Little League championship. He’s standing, 4th from right. He put on his first Little League uniform, instantly transforming himself into “a new personality: a baseball player.” The program had a profound impact, from the coaching he received to playing at beautiful Gault Field, on the Saugatuck River. He starred at Staples. Coach Brian Kelley called him the best player he’d seen since Bobby Valentine. Tim earned a full Division I scholarship to Kelley’s alma mater, Seton Hall University. Tim Hayes (#6) celebrates another Staples High School baseball win. His Staples classmates included Harry Reasoner’s daughter Ellen, and Linda Blair (star of “The Exorcist”). Tim remembers Cindy Bigelow too. The other day, as he and his wife were grocery shopping, her huge photo promoted Bigelow Tea. Her parents bought her a new car for graduation. “That was not my middle class experience in Westport,” he says. Thanks to 2 long-ago psychology classes taught by Charles Burke, Tim Hayes found his life’s work. Staples High School English teacher Karl Decker took this photo of the Hayes siblings, which they gave to their parents for Christmas. 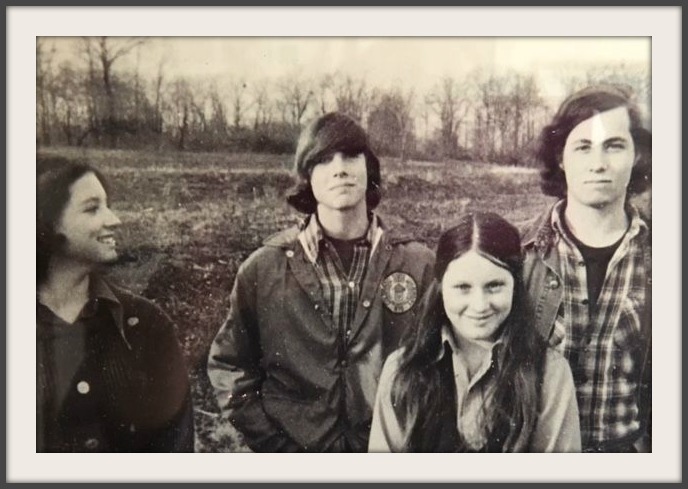 From left: Tim’s older sister Kathy, Tim, his younger sister Theresa and his older brother Larry. 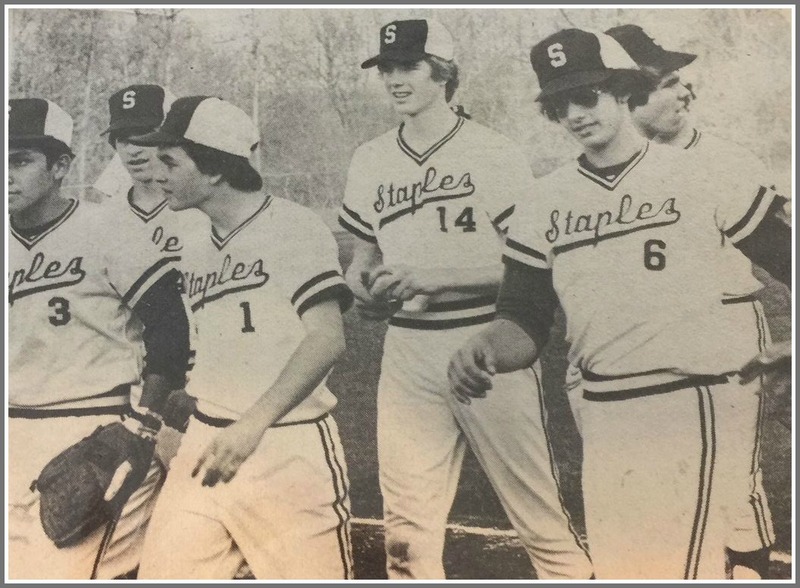 This entry was posted in Education, Looking back, Sports, Staples HS and tagged Brian Kelley, Charles Burke, Staples High School baseball team, Tim Hayes. Bookmark the permalink. WHAT A LOVELY WESTPORT STORY . . . .
Wow! Reading happily about Tim and came to the photo and thought,” I think I know these people! !” What an archival surprise that was! But Tim, you are thinking of retiring? How do my former students suddenly get older than I am? Where is Kathy these days? Be well, be safe, KD. Nancy, I thought you were leaving “06880.” What is the possible justification for your inane, non-sensical comment? Do you always do what Dan says? Don’t you have any other hobbies? Nancy, you grew up in Westport. Your parents had more financial resources than Tim’s did. Talk about hypocrisy — wow! Exactly my point. So correct it. Start with Compo. Whatever you say, Nancy. i’ll get right on it. When I read this entry this morning I have thought of how often I wanted to write something that would capture my growing up experience in Westport. Tim Hayes captured the feelings and sentiment perfectly. My experience was a little earlier in time than Tim’s so the names would be different. My Dad did not have a college education and he worked in a factory in Bridgeport. We rented and eventually after WWII built a small house, my dad doing a lot of the work. I got a wonderful education at Staples and did get to go to college and graduated. The people of the town were wonderful Mrs. Roman Heyn used to give me the glossy programs from the N.Y. Ballet and Symphony. The wife of the First Selectman Elliott Roberts was my Girl Scout leader and was my “shepherdess” who sponsored me for many events. Lucy Bedford Cunningham was a volunteer at Norwalk Hospital and took an interest in several of us when we were young teenagers because we volunteered at the hospital and the Red Cross Blood banks. No one, not a person, thought that they were any better than anyone else. They took an interest in expanding a persons experiences and education and it did not matter what their economic status or skin color was. Everyone was treated as an equal. There were very few people of color, true but those who lived here were valued and we were all taught that every person had value and merit. I looked up the meaning of “White Privilege” Yes, my skin is white and I can never know what it would be like to be another nationality. But I think that saying White Privilege made us who I am today is demeaning to those who do face obstacles every day because of their heritage, or disability or what ever. “Economic Privilege” Whatever, so much hypocrisy. Hi Karl! You prove my point….Staples hires the most talented English teacher..you! And you could take a photo too! I don’t know what the heck you did to my sister but she has been writing ever since she left Staples (and she made a good living by writing..oops..makes…she still works). She lives in Colorado with her family and loves being a grandmother. I know she would love to hear from you. Her email is kathyhayeswriting@gmail.com. I hope you are doing well and thanks for taking our family photo! Hi Nancy. Yes, you are speaking the truth. We were all very white and very privileged! I made my life work to help level that playing field! I’m making some progress I think. Those were great days Tim. There was a great group of people who supported baseball in Westport. The “privilege” referenced above came mostly from the dedication of the people of the town, some of it in the form of skilled teachers as noted above, but a lot of it from parents who cared deeply and volunteered in many different ways as noted in many of the posts above. Mr. Deegan, Mr. Hooper and Mr. Patterson coached the Bombers, Mr. Doyle coached the Hornets, but it was far more than that, it was the people who insisted that we have dance classes and music programs at the YMCA, it was boy scouts, girl scouts, it was volunteers who collected and built the first library and then the second and those that built the Levitt Pavilion. It was the events downtown, the parades, the booksales, the musical events and many others that served as entertainment and education for the kids. “Privilege” didn’t come falling out of the sky randomly landing in our midst by some strange accident of fate, it came from parents doing their best for their families and entire communities. Instead of trying to “shame” this type of “privilege,” we ought to encourage it in every corner of our country. Rich, wow! Extremely well said! Any my sentiments exactly! You described the Westport in grew up in. Thanks! I noticed that none of your family seems to live in the area. You nor they would recognize much of the wonderfulness you describe. As Mr. Gleason notes above, the “privilege” we had is quite a bit different today and it’s been a long time since when we could name the shop keepers and police and fireman and go to school with each other and have true talent like yours move us forward. The teachers you adored would likely be commuting from 45 minutes away and wouldn’t have as much time to engage with students. Your friends wouldn’t be from the high school baseball team or neighborhood because likely you’d be playing on (and paying for) a multi-town club team instead of Staples, and your parents would be bragging about your tournament-induced airline frequent flyer miles by 10th grade. You don’t form life-long bonds with teammates, neighbors or siblings after school anymore but are instead “enriched” 1:1 by a $150/hour tutor for even the lowest priority class. The attendant at Norwalk Hospital isn’t an heiress giving back to her community, but a minimum wage contractor taking 3 buses across 3 towns to get to her 3 jobs, just to pay the rent. The fact is Westport has changed radically from the time Tim and I grew up there (the 1960’s/early 70’s)–and in a not great way when it comes to economic and social diversity. Our parents built a very modest house on a 1/4-acre on Kirock Place then in a neighborhood full of tradesmen, cops, and firemen. Our dad was a reporter for the Bridgeport Post; our mom a night nurse. The bankers and gangsters from Wall Street didn’t move in for another couple decades, and now I literally get disoriented driving around certain neighborhoods (especially the North Turkey Hill area) because of all the new McMansions there. I’m not sure applying the white privilege label is very meaningful to the “old days” when Westport was far more middle and working class compared to the decadent wealth it represents today. Hi Larry…nice surprise. Thanks for clarifying that our family was not financially “privileged” . But, you are right that “privilege” had nothing to do with the article. I think that gentleman Chris missed the point. I was just trying to say thank you. Great memories Tim. Westport really was a great place to grow up!